When I was shopping for a new bassinet while pregnant, the HALO Bassinest Swivel Sleeper kept pulling up at the top of my search queries. It looked sleek, convenient, and like the perfect bassinet for my little one. 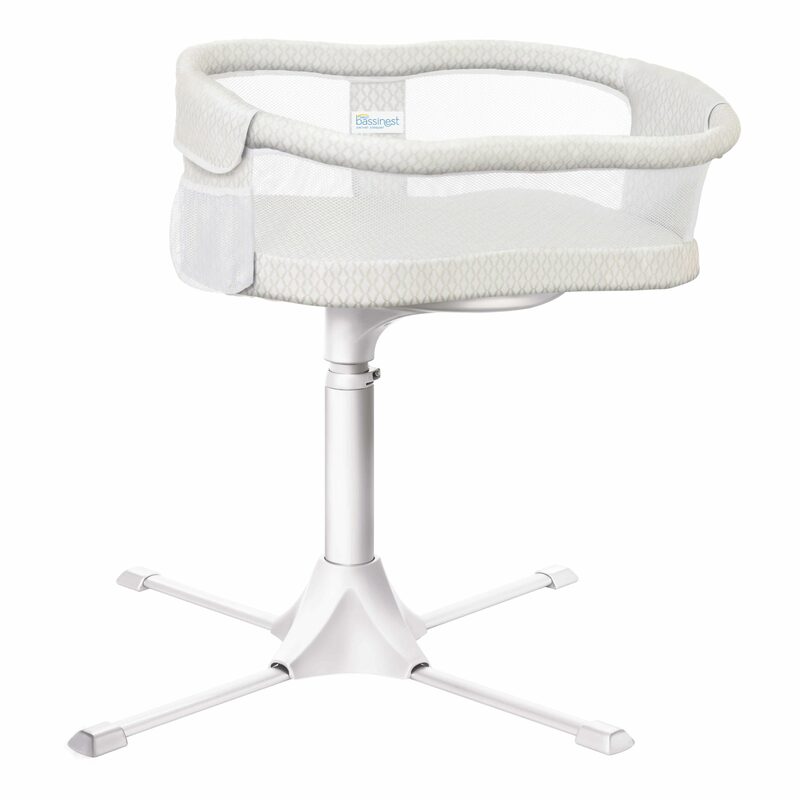 I spent several hours reading all of the reviews I could find on the bassinet, and the people who tried it, loved it. I had heard of the HALO company before, mainly from their SleepSack wearable blankets. I actually had one when my daughter was a baby, and loved that I could feel safe giving her a wearable blanket, without worrying about loose blankets in the crib or bassinet with her. HALO is a company I have grown to trust, and with good reason. 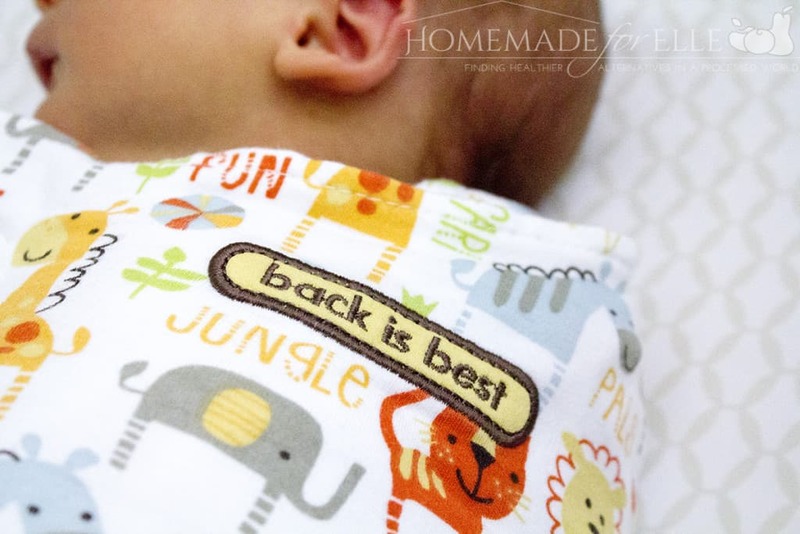 They have won numerous awards in baby safety, including a 2008 Commendation Award for Product Innovation for Consumer Safety, and the International Hip Dysplasia Institute recognition for “Hip Healthy” swaddle sack design. You can read about all of their awards and accreditations here. They also do a tremendous amount of promotion on safe sleeping for infants, and are working with more than 1,300 hospitals in the US and Canada to offer the HALO Safer Way to Sleep Initiative. When it comes to my baby’s sleep, safety is my absolute first concern, and I feel safer at night, using HALO’s products with my babies. After hearing how many people loved the HALO Bassinest, I had to have it. 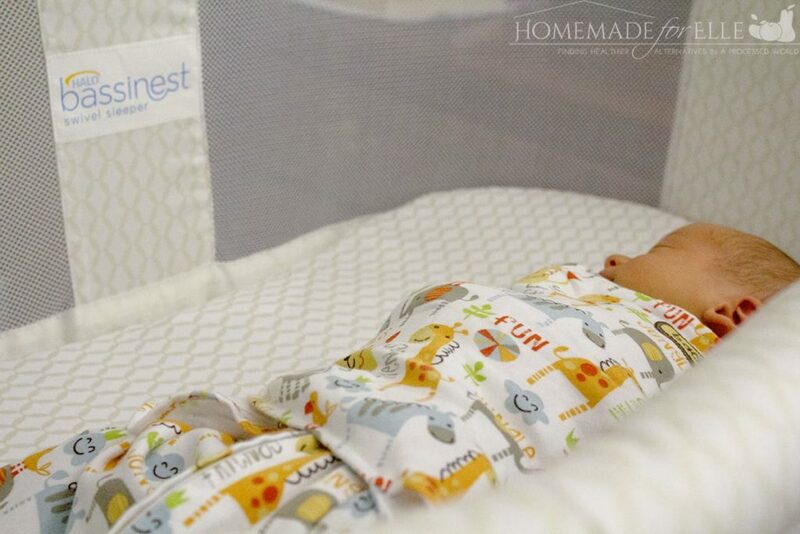 I received the HALO Bassinest Swivel Sleeper – Essentia Series, had my husband put it together, then I anxiously awaited for my bundle of joy to arrive! My son was born almost three weeks ago, and has been sleeping in the HALO Bassinest since we brought him home from the hospital. My favorite thing about the HALO Bassinest is how close I can get the bassinet to me, while I am laying in my bed. I want to be physically close to my son, while still keeping him safely in his own space. 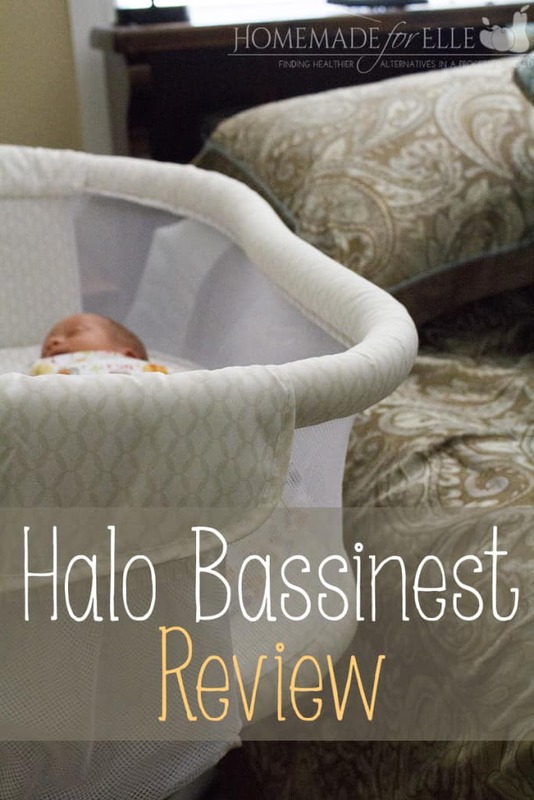 The HALO Bassinest has an adjustable height that allows the bassinet to move from 22″ to 34″ tall, which allows me to adjust the bassinet to my eye-level when I am laying in my California King size bed. The sidewall of the bassinet lowers, to allow easy access to baby for midnight feedings. My newborn is nursing every hour or two right now, and it is great to be able to lower down the sidewall, and pick him up out of the bassinet, without having to get out of bed. The base is heavy and solid, making it almost impossible to knock over, so I feel safe having my baby in the bassinet. We don’t have big dogs inside, but I imagine that would be a huge advantage for a family that does have dogs and are worried about them knocking over the bassinet. I can’t imagine any dog of any size would have the strength to knock this down. The HALO® Bassinest™ Swivel Sleeper Essentia Series is new (just came out in January!) and retails for $219. You can purchase it from Amazon, and check out how much the other users love their bassinet while you’re there! You can also see in the picture above, that my baby is wearing HALO’s new 100% cotton SleepSack Swaddle. I love this swaddle blanket, so much. He loves to be swaddled, and sleeps easily for up to 4 hours when he is in this swaddle. I also appreciate that it just swaddles his arms and torso, and not his hips or legs, which is recommended for safe swaddling. Get more tips and stay up to date with HALO on their social media! Follow them on Facebook, Twitter, Pinterest, Instagram, Google+, and YouTube! I loved it! It seems that it doesn’t make the baby very umcofortable, but comfortable with it. You can always take care of your baby and leave the baby on your room with it! I love the wearable blanket! I always worried about my babies being cold but also didn’t want to leave them with a blanket that they could yank up over their face. The swivel feature on the bassinet is genius. Getting out of bed with the bassinet right up beside it always required way more grace and finesse than I possessed, especially in the middle of the night. This looks like a fantastic bassinet! I love that they make is easy for nursing. When my daughter was young, I had to take her to bed with me to nurse, there were times when I was so tired, I was afraid of sleeping on her! Love this. Congrats on the new addition to your family! Having your baby close by at night while you’re nursing is so important. I wish that they’d had a sturdy bassinet like this when my children were babies.